1) Start a budget. To rebuild credit you need to get your spending on under control. It is crucial to recovering your credit. There are many non-profit organizations in Richmond, Newport News, Virginia Beach as well as surrounding areas that can assist you with budgeting. Also, here is a link to Kiplinger’s Household Budget Worksheet. If you are like many people and do not have a regular paycheck, check out this article on Lifehacker. There are plenty of other resources around the web to help you get started with a budget. So, get searching! Starting a budget can be a lot of fun and an insightful step to finding out where your money goes. 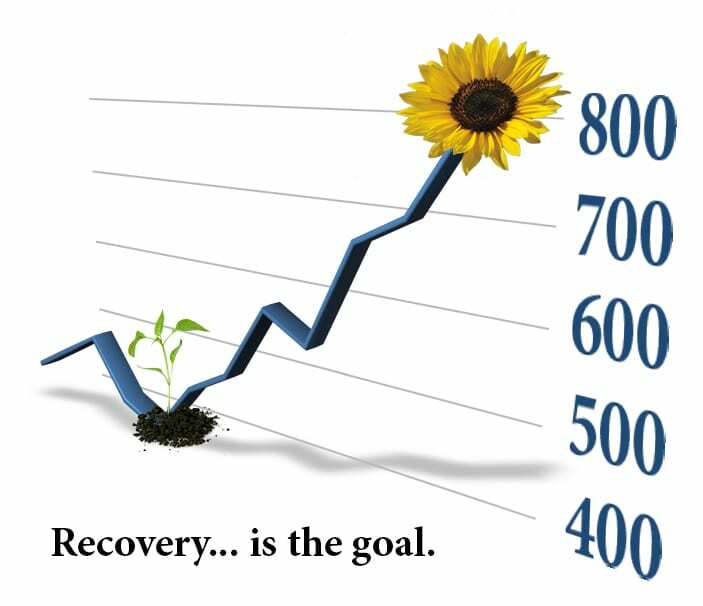 You cannot recover fully without getting your spending and costs under control. 2) Write down everything you spend money on for a week. While they call it “disposable income” they really didn’t mean flush it down the toilet. What most people find when they take this small step is that they realize their “soft costs”. That $4 cup of Starbucks or that Big Mac every day really add up in a month both in costs and added inches. Get a small pad and start jotting down every single thing you spend money on each day for one week. Having that information will help you make adjustments and increase your spending awareness. We want you around for a long time so cut back on the fast food and pack a lunch. It will not only save you inches but will save you cash. 3) Make it a family affair with one basic rule “full disclosure”. You can not rebuild credit if everyone in the house is not cooperating. It also cannot happen if you are separating bank accounts and not disclosing spending. I am not saying you have to combine accounts and coordinate spending. I am saying if there is an imbalance in household income and responsibility there is a greater likelihood that one or both members of the “team” will fail. 4) Learn to shout “No”. Saying yes to children, family and friend is a bottomless pit. At the bottom are empty pockets and future financial stress. I cannot tell you how often bankruptcy clients have patted themselves on the back for supporting or loaning money to relatives. Do not be a lender. Make the friend or relative responsible for their decisions. They can be my client instead of you. That way I can send these tips to them so they learn not to be tempted to impose on you financially again. 5) Try a revolutionary approach: “No new purchases for one year”. Ask yourself. What does it really feel like to do without? Will you die if you don’t get that new watch or earrings? Will those heels really make you look thinner? I am not talking about a binge on frugality born from reactions to financial troubles. I am talking about a real effort to re-program your thinking about what it is you want and want it is you think you want. If you can find bliss in choosing not to be a consumer you will rejoice in the satisfaction of having savings. 6) Check your credit reports DURING the bankruptcy to confirm all of your creditors are listed and all negative reporting has stopped. If you missed listing any debt it becomes more complicated and difficult to resolve. If you find a missed creditor while your case is still active you only incur the cost of filing an amendment to add it to your case. If creditors you listed are reporting after the time you filed your bankruptcy this is not only a violation of your bankruptcy automatic stay and possibly your bankruptcy discharge but it is also a violation of the federal Fair Credit Reporting Act. Notify us if you find this occurring. It could mean money in your pocket. 7) AFTER your bankruptcy is finalized, check again to make sure your credit reports have discharged your debts and closed accounts are properly reported. 8) Commit to paying bills on time especially if you struggled with it before. Bill paying habits make a huge impact on your credit score. If you cannot accomplish this one requirement you might as well stop reading. Making on time bill payments will improve your credit score over time. Meeting payment dates is a huge step in recovering from bankruptcy. If you are challenged by this then consider signing up for automatic bill pay to have the payments come out of your bank the same day your pay is automatically deposited. 9) Use credit wisely. There are different products and services you can take advantage of to help rebuild credit. The easiest and first one to consider is a secured credit card. Make sure they send reports of your monthly payments to the credit bureaus. Use your credit card wisely in order to build up credit only on items you can afford to show you are in control of your spending. Make regular payments even if you can pay it off all at once. Start with a $500 balance. As your credit improves, ask the bank if you can slowly start raising the limit. Be wary of companies that ask for outrageous start-up fees (some places try to charge up to $200) or for you to call a 1-900 number that will charge you money. Once again, be sure to ask if your transactions will be reported to all three major credit bureaus. You want them to see that you’re paying off your debts so your score can begin to improve. Know that some banks might force you to wait for a year after you’ve filed bankruptcy to get a secured card. If that’s the case, focus on building up your savings in the meantime. Get a secured card at a bank you want to continue to use for awhile. The relationship you build with the bank can pay dividends later. You’ll eventually want to ask if you can switch to an unsecured card with the same bank. 10) Create a goal like the purchase of a car or house. If you want to rebuild your credit score, two years after your bankruptcy you will be eligible for an FHA loan assuming you meet qualification rules. Some lenders can even qualify you for a car loan sooner than that, however it will probably be at a high interest rate. A goal will help you find the energy to research the requirements for what you need to get the loans and stick with the program of credit recovery. 11) Having a checking and savings account is mandatory. If you do not already have one you need to start investigating local financial institutions to make an intelligent choice. Look at the services and interest rates. Look for free checking and savings. Credit unions usually have better rates and are a lot more accommodating when it comes time to apply for a loan. 12) Get a retail or gas card. Once you get on track with a secured credit card you can try and apply for a retail or gas credit card. Make sure the card reports to all three bureaus. Avoid large processing or application fees. Try to get the card at a store where you are not likely to go on an uncontrolled shopping spree. Gas cards are generally more useful. Compare the different gas companies to pick the one that has more competitive fuel prices. Balance this consideration with how convenient they are. There is no reason to spend a lot in gas to save a little money. 13) Dispute incorrect information on your credit reports. Make sure you follow up with any reporting agency who lists incorrect information on your credit report or who continues to allow discharged debt to appear on the report. To dispute incorrect information on your credit report listed by the bureaus listed above, you can use the online dispute form on Equifax, the credit maintenance services page on Experian, and the dispute section under the personal services category on TransUnion. 14) Build a small cushion in savings. Whenever you can, throw a bit of money toward a savings account reserved for minor emergencies. Savings should be a habit. If you take it out of your check bi-weekly you won’t even miss it. That way, if you suddenly have to drop $600 on urgent auto repairs or a medical event, you don’t need credit to do it. Start small. Most financial experts recommend having enough money in savings to cover 6 months of expenses. That is a little extreme for someone just coming out of bankruptcy (though you can make that an eventual goal). For now, just put aside whatever you can spare and set a goal to get up to between $500 and $1000, which will cover most minor emergencies. 15) Avoid finance companies and payday loan companies. Remember, finance companies and payday loans exist to make a profit. Instead of being swayed by debt consolidation offers, focus on maintaining your budget, putting money into savings, and slowly building up the limit on your secured card or retail card. Learning to live without needing credit is the goal. Your only need for credit should be as part of your program to rebuild to buy a car and/or a house at a reasonable interest rate. Avoid credit repair scams. Don’t pay a lot of money to somebody promising to rebuild your credit in a short amount of time. It can’t and won’t happen. It will take time to repair your credit, but you’ll likely have a score above 700 before the bankruptcy falls off your report. Don’t make the same mistakes twice. Review the events that caused your credit to fall to subprime levels in the first place. Take ownership for your mistakes but rather than beating yourself up over it, learn from it and start over. It’s not about how hard you fall, but how quickly you get back up. Remember is you are at the beginning of deciding whether to file bankruptcy, find an attorney that believes recovery is the goal. You will rebuild credit a lot quicker. Click Here: Get Started Today!